Ancient Stones - Lothian - 003 Standing Stone, Pencraig Brae, East Linton. This large standing stone, although reaching just over 3.00m and nearly 0.90m in breadth is often missed by travellers on the busy A1, only 30m or so to the north. The stone is situated in a cultivated field, has a pointed top and bears no markings. The stone is located of the A1(trunk) road between East Linton and Haddington. 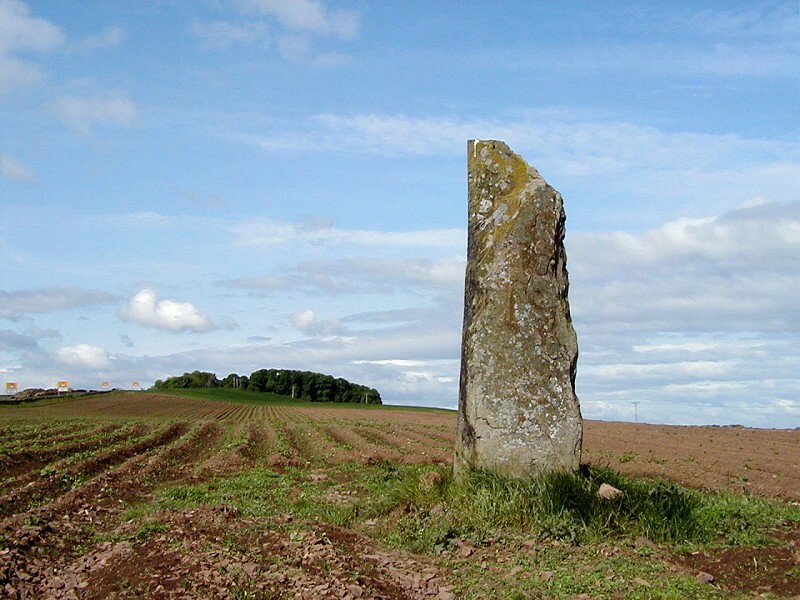 The stone can be easily seen in a field to the west of the East Linton, on the east slope of Pencraig Hill. The field was planted with potatoes at the time of visit and you should take care not to cause any damage. At road-side parking lay-by on the A1 nearby. This solitary standing stone is easy to get to, with parking nearby and it also offers outstanding views of Traprain Law and its hill fort. There are three other standing stones within a mile or so and one wonders just what the ancient landscape might have looked like before the need for large open fields to suit modern farming practice. How many standing stones and stone circles have vanished beneath the plough? To get a better grasp of the area, climb Traprain Law and use a pair of binoculars to pick out the standing stones at 006 Easter Broomhouse, 004 Standingstone Farm, 005 Kirklandhill and 015 The Loth Stone.